From airline bookings, to hotel check-out, to the various customer service interactions that take place along the way, few industries have as many customer touchpoints — and expansive customer data — as the travel and hospitality business. Prior to the big data era, the travel industry relied on loyalty programs for insight into customers’ historical behaviors, patterns, purchases and preferences. However, only 40–55 percent of travelers are in an airline’s loyalty database. “The travel industry has so much information about customers, yet they’re probably the biggest data under-utilizer,” observes Shep Hyken, author and customer service consultant for brands like Marriott and American Airlines. Companies are now in an arms race to capture and capitalize on data gleaned from consumer trends. That’s why airlines and hotels are going to great lengths to collect and analyze data in an effort to better understand their customers and offer highly personalized customer service. Here’s a look at what the travel industry is doing today to attain, and utilize, a true 360-degree customer view. Most hotels and airlines try their best to employ data sitting in a customer relationship-management (CRM) system or loyalty database. However, to paint a full picture of the customer, the CRM approach needs to be augmented with the collection and analysis of information from secondary touchpoints such as online booking, customer service calls and social media activity. Shashank Nigam, author of Soar: How the World’s Best Airline Brands Delight Customers believes that many hospitality brands are only scratching the surface in terms of utilizing customer information. “Airlines particularly are in their infancy in terms of big data,” explains Nigam. “However, collecting data is just the first step. They need to drive actionable insights from that data, and create a competitive [customer service] advantage.” As a direct result, hospitality brands are now deploying data collected from all manner of sources for more customized service interactions. By only loading food products that are likely to be consumed, the airline has lowered food-waste and fuel-burn costs. Hotels facing similar challenges in terms of food and beverage operations could use the same strategy to improve their procurement and inventory efficiency. What’s important for airlines and hotels to remember is that an intense focus on improving customer service often leads to benefits in other (sometimes unexpected) areas. Most consumers now view loyalty programs more as “commoditized” marketing programs; they’re enrolled to amass enough miles or points to receive a reward, without building true brand loyalty in the process. Leveraging data for enhanced experience and service will be one of the major ways travel brands differentiate their loyalty programs in the future. Hyken believes hospitality brands are making a big mistake if they rely solely on points, perks and rewards schemes to build sustainable, long-term loyalty. “My question to airlines and hotels is always, ‘If you take away the points or the miles, will the customer still do business with you?’ That’s true loyalty,” says Hyken. Personnel at every customer touchpoint, including the call center, can then be alerted if a customer they’re engaging with has a high propensity score for purchasing products or services associated with that specific interaction. Smart brands are moving in this direction, realizing that loyalty programs are a way to build a complete view of each traveler. Ross-Smith predicts that brands will continue to consolidate customer data, moving towards what he calls “a single customer-profile platform model”. Data from internal and external sources will feed into an engine, which will update propensity scores in real time and feed into the customer profile for a call center agent, front desk concierge or flight attendant. “Qantas, for example, has a list of the most important customers flying on any given day,” Ross-Smith explains. “The list [weighs] multiple factors, and is not based purely on frequent-flyer status. Therefore, it’s possible for someone who has never flown in their life to be prioritized over a passenger with top-level status.” The result is that Qantas is able to identify, and provide top-notch service to customers that have the potential to be of very high-value in the future. Customers today expect more seamless and personalized treatment than ever before. The travel and hospitality industry is receiving fewer free passes from customers for flight delays, unpleasant rooms and overall poor service. 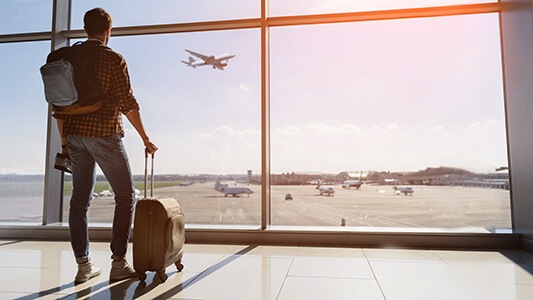 But by enhancing data collection, and using existing loyalty data more efficiently, travel brands can leverage this 360-degree view to increase — and deliver on — their customer service promise. Personalize CX with knowledgeable, efficient customer care and omnichannel digital solutions.